I want to visit practically everywhere, including Chicago, but it's never been at the top of my list, particularly not in February. However, when the opportunity presented itself, I naturally jumped at the chance. Although this quick trip provided a mere snap shot of Chicago, its quickly moved up to the status of cities I must revisit. It's filled with culture - music, art, architecture, and well, great hot dogs and pizza. 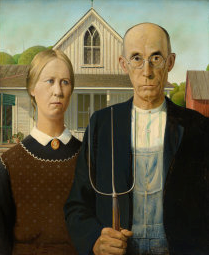 From Cloud Gate in Millennium Park to American Gothic at the Art Institute, Chicagoans have much to boast about in the world of art. Cloud Gate, aka 'the bean', is undoubtedly one of the most photographed sculptures on the planet. It looks other worldly, as if at any moment it could morph into something new or simply slink off. 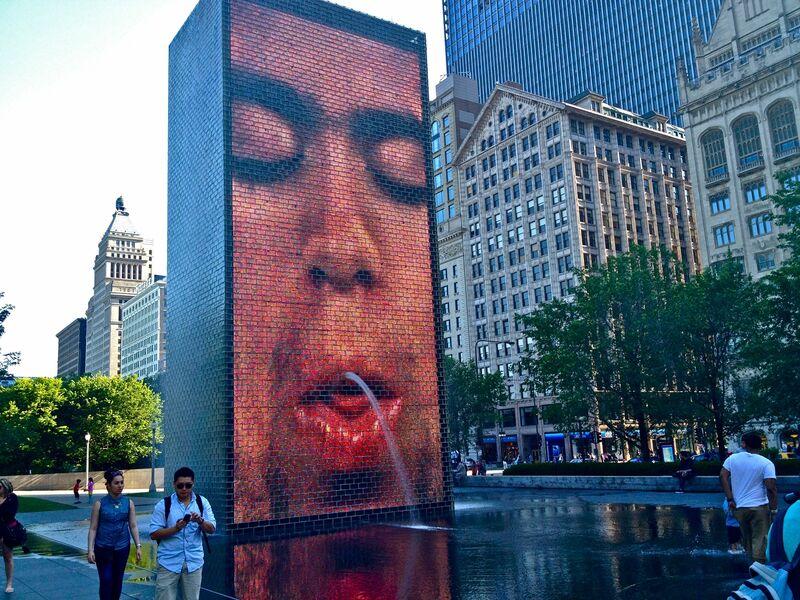 Not far from 'the bean' is Crown Fountain, also in Millennium Park, a giant pair of towers which squirt water on warm days from an ever-changing series of local Chicagoans faces. It is a rather odd, but strangely captivating installation. Art abounds throughout the city. Even in the small spaces of earth between the sidewalk and the road, sculptures have found a home. If you're an art lover, Chicago won't disappoint, and there's no disputing the art housed at the Art Institute of Chicago is extraordinary. The art of food in Chicago won't disappoint you either. Just as Philly has its cheese steaks, New York its cheesecakes and Baltimore its crabcakes, Chicago has food fame of its own - Chicago dogs and Chicago deep-dish pizza. Food here, like art and architecture, is steeped in a rich history influenced by a large cultural melting pot. On your first trip, you absolutely must indulge in at least one of these Chicago treats. However, don't make the mistake of ordering your usual large pizza here - this is no ordinary pizza. You won't be able to finish one, unless you're a total glutton. One or possibly two slices are a delicious meal! 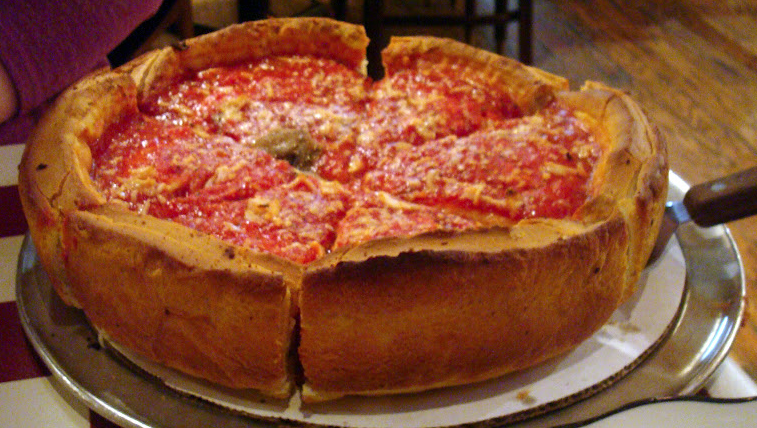 A couple highly recommended traditional deep dish pizzerias are Lou Malnati’s and Pequod's. We ate at Giordano’s, also recommended, on downtown's central loop for convenience. It was very good. No time for Chicago dogs on this quick weekend trip (what a bummer), but I'd gladly go back to Chicago just for that (any excuse), which would undoubtedly prove to be the most expensive hot dog in history. Fortunately for me, there are great Chicago style dogs in Fort Lauderdale at Hot Dog Heaven, and in Tampa at Mel's, which I visit whenever I get the chance. Still…it wouldn't take much more to convince me to head back to Chicago. It really is my kind of town! I do think I'll wait however, for it to get a little a lot warmer! More on the sights and sounds of Chicago next post.